A delicious dessert deserves a beautiful presentation, and this Eternal Leaf Cake Plate & Server couldn't be lovelier. The leaf-shape design becomes truly artful in the classic ivory fine china of Lenox. 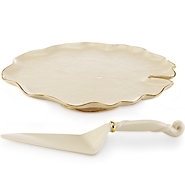 Both the plate and server are accented with 24 karat gold.